^ Eitner, Lorenz. 19th Century European Painting: David to Cézanne, 191–192ページ, Westview Press, 2002年. ISBN 0-8133-6570-8. Berger, Klaus & Gaericault, Thaeodore. Gericault: Drawings & Watercolors. New York: H. Bittner and Company, 1946年. Borias, Georges-Antoine. Géricault: The Raft of the 'Medusa' (映画). The Roland Collection of Films on Art. Touboul, Adrien 監督、1968年. Muther, Richard. The History of Modern Painting Vol. 1. ロンドン: J.M. Dent, 1907年. Novotny, Fritz. Painting and Sculpture in Europe, 1780 to 1880. ボルティモア: Penguin Books, 1960年. Riding, Christine. 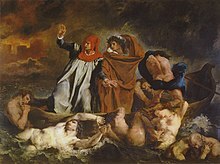 "The Fatal Raft: Christine Riding Looks at British Reaction to the French Tragedy at Sea Immortalised in Gericault's Masterpiece 'the Raft of the Medusa'". History Today, 2003年2月.